North Norfolk has one of the best climates in the UK. It rains throughout the year but only very little every time it does. Sunshine is also lesser in North Norfolk than any other part of the country. The global climate has been changing, so even the local climates are changing too. Climate change is a main driver of change in North Norfolk Coast. Geological evidences suggests that intensive climate changes have affected the area through rising sea levels. 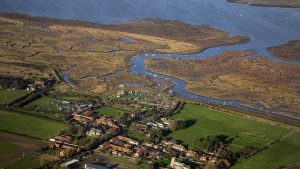 The rising of the sea, coupled with the warming of our climate may be having an impact on the coastline of North Norfolk and other important facilities. It is scientifically recorded and the everyday experiences in the North Norfolk have clearly shown these changes. One obvious change is the disappearance of insects and butterflies one species after another. Geographical changes like erosion have removed villages and structures in the past. This is making it impossible to maintain access roads to beaches so it has a great impact on tourism. Science have further predicted that in this century, heat waves, droughts, floods and storms will occur more frequently. Summer temperatures in the whole of East Anglia will rise to about 5°C and will vary constantly. There will be less and less rain. Sea levels will rise continually and the sea will get warmer. This may also lead to loss of farmland, businesses and more infrastructure. The local fishing industry will be affected by this since this will bring changes to the marine habitats. New diseases and soil loss will become the farmers biggest challenge. After taking account of these changes and all its uncertainties, Partner organisation representatives are taking and developing actions that will enable the beauty of the area and communities to be sustainable. Being an AONB, it is everyone’s job to protect the coast of Norfolk.